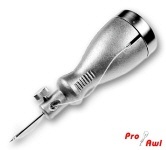 The Pro-Awl is a practical hand-sewing tool for quick and durable sewing of shoes, saddles, tents, sacks, canvas, felt and many more. You can use all kinds of thread. The stitch is a backstitch like a sewing machine does. The tool is completely made of rustproof metal. Inside the hollow handle, there is the bobbin with extra stable thread, a set of industrial needles and a helpful shuttle. A multilingual operation instruction is included with every awl and explains the right sewing step by step. Like this everybody will be able to make professional seems after a short period of practicing. Further information at www.pro-awl.com.